Awards given for Best Amateur Overall & Best Professional Overall. Additional pie categories will also be awarded. $5 entry fee. Up to two pies per contestant. Drop off pies at Depot between 8:30 – 10am in disposable tins. We cannot be responsible for your favorite baking dishes! Please RSVP by Sept 27 if you wish to participate. Email info@anacortesfarmersmarket.org or call 360-982-8023 and leave a message with your name and how many pies you are entering. Crust and filling must be homemade. The main ingredient (or a majority of ingredients) should come from AFM vendors. Please provide a list. Pies must be received NO LATER than 10 am on Saturday, Sept 29th with a card listing pie name, your name and list of farmers market ingredients. Pies served to public after awards are announced. Like to bake but don’t want to enter? Please donate a pie to our Bake Sale Fundraiser! We always need more whole pies. The demand for pie is so high that we can’t keep up! Please consider baking pies or pie-ish goods such as hand pies and tarts to donate to our fundraiser. These will NOT be judged, just enjoyed! No store bought items please. * The demand is for whole pies but single-serving size is ok too (tarts & hand pies). *Please wrap each item/portion in plastic wrap or other covering. *Deliver your goodies at the Depot no later than 10am with a description. 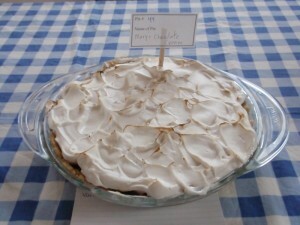 Bake Sale goods will be available during pie judging; pie slices will be available after prizes are announced. All proceeds go to the Anacortes Farmers Market, a 501(c)(3) non-profit organization.